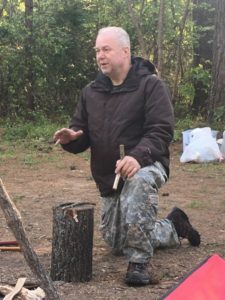 Owner, Thomas Weathers – Trail Blazer Survival School, Inc.
Thomas Weathers, the owner of Trail Blazer Survival School, was raised as a survivalist in the mountainous areas of Cleveland, South Carolina. His father and grandfather taught him skills they had learned from Tom's great-grandfather who was a woodsman from Tennessee. During much of Tom's childhood, he lived in places with no electricity or running water and had to help gather and catch food from the environment. Upon completion of high school, Tom joined the U.S. Air Force where he learned electronics, ground based radar, radar bomb scoring, and ground directed bombing. Temporary duty assignments would put him in isolated locations where he would practice his survival skills to pass the time away while waiting for aircraft to commence their bombing runs. After his time in the Air Force, Tom began taking jobs to support his growing family and improve his skills in management. He earned both a bachelors degree and a Master's degree in business and developed his entrepreneurial spirit. Tom has successfully owned and operated several businesses including one that has established a multi-million dollar revenue stream. 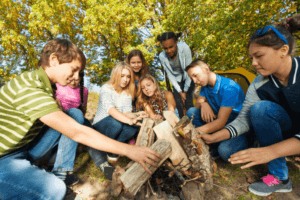 His businesses include a pizza restaurant, a computer sales and service company, a preschool, and now Trail Blazer Survival School & Adventures.